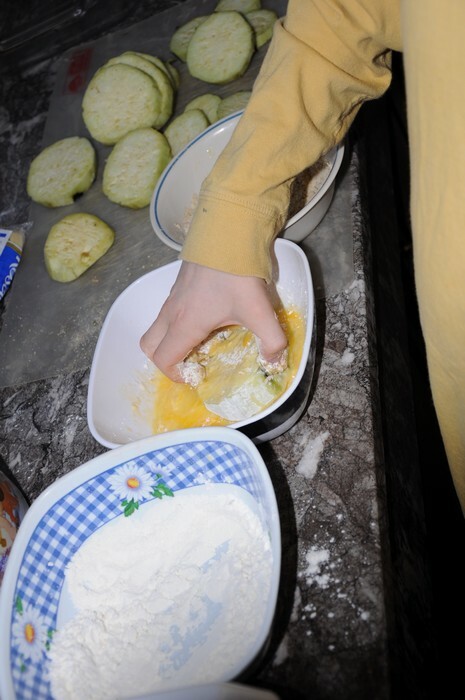 A simple kids cooking lesson is to learn the coating and breading technique also known as dredging. We will show you several recipes you can use to practice this method. This is the same way you'd make chicken fingers or chicken nuggets and breaded pork chops as well. First we will use the coating and breading technique on eggplant slices. Zucchini also works well too for this recipe. We are making Eggplant Parmesan here and my son is coating sliced eggplant first in flour turning both sides, then in beaten egg or milk, then in breadcrumbs. Add to a hot skillet with a small amount of oil in it. Cook both sides until done. For baking in the oven. Placed coated chicken or vegetables on cookie sheet and spray with cooking spray. Bake in the oven at 400 degrees. 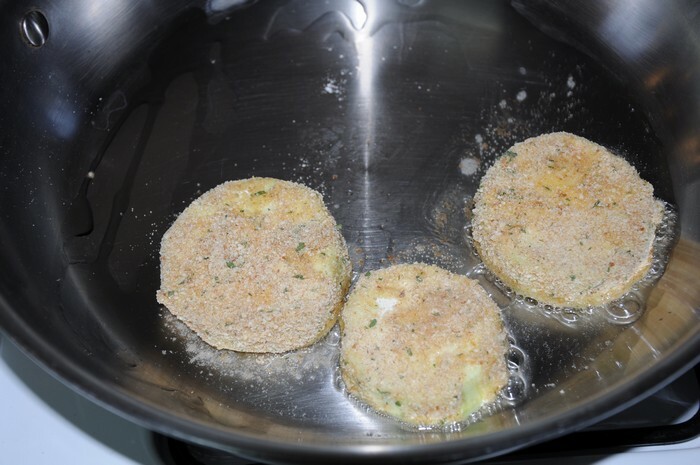 To make Eggplant Parmesan, add fried eggplant into casserole dish. 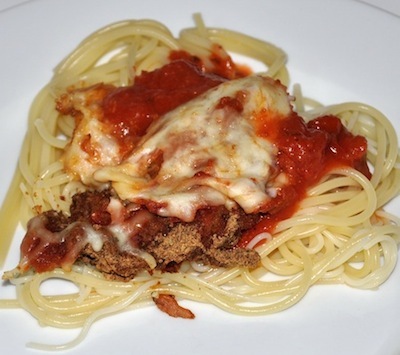 Top with a small amount of spaghetti sauce and sprinkle with mozzarella cheese. Bake for 10-15 minutes until cheese is melted. 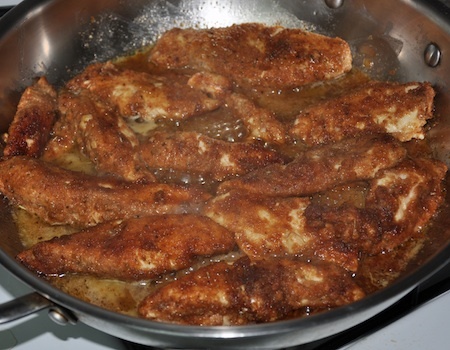 This breaded pork chop recipe is so yummy and makes super moist pork chops. I often prepare this recipe ahead of time and leave it in the fridge. Then bake before dinner. Set three flat pie plates or flat dishes next to each other. In one add flour and seasoning salt, in another add milk and the last add breadcrumbs. Dip pork chops in flour first covering both sides. Then dip both sides in milk. Then dip both sides in bread crumbs. Spray with cooking spray. 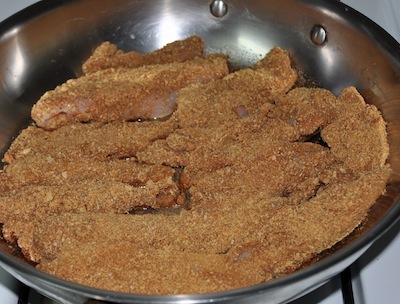 This will make your pork chop crispy without frying it. Bake at 375 degrees for 20-30 minutes or until pork is done. Spray a casserole dish and set aside. Lay two separate dishes or pie plates next to each other. Add egg in one and beat. 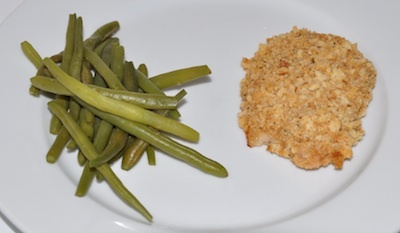 In another dish, add bread crumbs and Parmesan cheese. 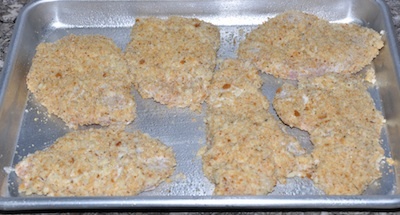 Dip each chicken breast in egg and then coat with bread crumbs. You can use beaten egg, milk or buttermilk to dip your chicken in. Place in casserole dish. Pour spaghetti sauce over chicken and sprinkle with mozzarella cheese. Use as much sauce as you would like. Bake400 degrees for 15-20 minutes. While your chicken is cooking cook any size of noodles you'd like to serve with the chicken parmesan and serve with extra spaghetti sauce. Kids can help coat chicken just make sure they wash their hands well after handling chicken. They can also help prepare a fruit salad or green salad to go with dinner. A great Chicken Piccata Recipe with a honey lemony sauce. Boil water for pasta. Meanwhile, flatten chicken breasts with kitchen mallet. Then cut chicken into smaller pieces. Mix flour, cheese and seasoning together in flat dish. 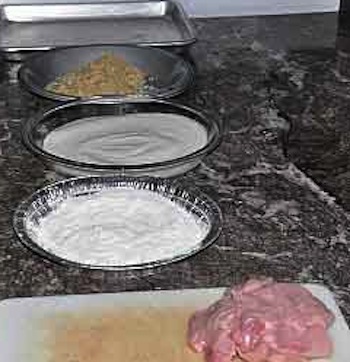 Pour milk in different flat dish.Place chicken pieces in milk, then coat chicken in flour mixture. Add olive oil to frying pan and brown chicken. Cook pasta. Once chicken is browned. Add in the saucepan,butter, honey and juice of one lemon. Heat several minutes and serve over cooked drained pasta. Four easy recipes for learning the coating and breading technique.